Retracing Jack Kerouac is a project 20 years in the making. Having read On The Road for the first time all those years ago, the fascination with Kerouac’s work and his life story never left me. The intervening years were spent reading most of Kerouac’s books and doing research into his life as well as other writers and characters associated with the Beat Generation. 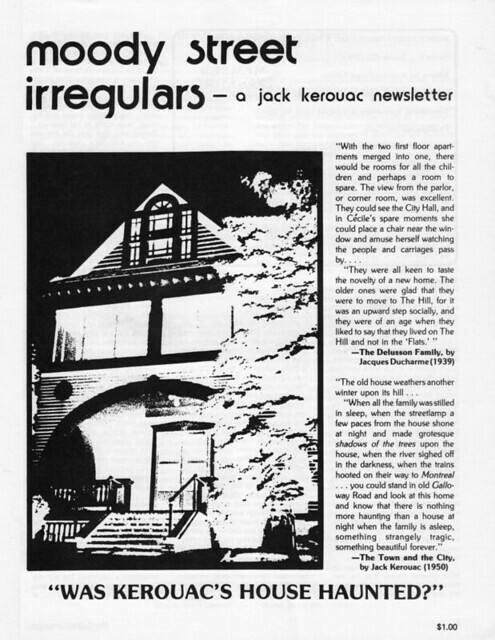 As On The Road is to no small part about seeing and experiencing the USA, the prospect of taking a trip visiting some of the places described in the book as well as other places important to Kerouac’s life, was always somehow in the planning stages, however vague they were for a long time. The possibility of finally making this trip presented itself in 2010 and so I didn’t hesitate to go on the road in October that year. The journey took me to places such as San Francisco, Denver, Boston, his hometown Lowell,MA and New York City. The journeys between those places were partly done by train (from SF to Denver and through the Midwest to Omaha). Of course Kerouac and specifically On The Road is mainly fabled for the long distance car journeys with Neal Cassady, but train (and bus) travel actually played an equally prominent role in his life and indeed On The Road, so I felt compelled (together with more practical concerns) to go down this route when planning the trip. I came back with about 4000 photos, not all of them good, but many of them Kerouac themed. At the moment I am compiling a book featuring a selection of the photos that I feel are most important to his life’s story. The aim is not necessarily to show the actual places things happened, as in the intervening years the cities, places and houses have inevitably changed a great deal or disappeared altogether, but to capture a little bit of the spirit of what is left of those places wherever that was possible. Other photos show the transformation the places written about in his books have gone through. The book will be published in early summer 2012 and will be called ‘Anywhere Road’. The blog you are reading was started to prepare myself for the upcoming publication of the book and features my thoughts, photographs and other bits of information related to Jack Kerouac that will guide me through the process of finishing the book. Your book sounds great! I made a similar trip some years ago and it was a wonderful experience. I look forward to seeing “Anywhere Road” soon. Good luck with it! Thanks for commenting on my AMS blog post. It’s always a pleasure to find a fellow Kerouac lover. I’m wholeheartedly looking forward to your book. 70+ books on the Beats is not enough. 70+ books is impressive by the way, do you mean just biographies or are you talking about the novels and poetry collections as well? How do you stand on Allen Ginsberg? I have become a huge admirer of his work (and person) recently as well. How’s your thesis going? When do you have to have that finished by? I have not checked out that group yet, but I’ll make a note of it. Thanks. I love Ginsberg. I actually read Howl and Other Poems before I even knew about the Beats or Kerouac. That one little book changed my life. I identify most with Ginsberg personally, though reading and studying Kerouac is probably the most fascinating aspect of the Beats for me. If you haven’t already, I recommend you check out The Life and Times of Allen Ginsberg, a great bio-doc that gives a good overview of his life and works. Also, his poem “Kaddish,” about his mother Naomi, is probably the best thing he’s ever written. It’s heartbreaking, moving, and deeply profound. My thesis is going well, though I’m juggling a lot of different things in the air right now. I wish I had more time to devote to it. It’s due in May, so once everything’s finalized I’ll definitely let you know. I wish you more than luck on the book. It sounds exciting. Thank you! It means a lot to me. Jack Kerouac is my favorite writer and a personal “idol” and has always had a special place with me…I’ve done a little “retracing JLK” within my own personal travels cause I’m sort of a history buff and so following him around SF a bit, and found the house he lived in there with the Cassidy’s and wrote one of his great ones (was it On The Road?) etc…But nothing on such a grand scale as you are doing…Very impressive I must say I love your passion here and I love the subject matter…Will be back to check out more! (P.S.S.) Oh yeah, also found the building where took place that infamous night where Howl was read in public for the first time, where Jack laid down on the floor, etc…it’s on Fillmore and…I think around Union St. Have you been there yet?…you probably have, I haven’t checked out your entire site yet it’s probably in there! Keep on keepin on…it’s an awesome project! Super project! Kerouac is a favorite writer. I believe he had at least one trip with the photographer Robert Frank too. I love Kerouac’s introduction to Frank’s book “The Americans”. Is ‘Anywhere Road’ on the market yet ? (Amazon doesn’t list it) Tanx. You won’t find it directly, but if you search for Anywhere Road you’ll find it.